Pinkstart is the new global crowdfunding platform designed for the LGBT community. A network where you can discover and support awesome projects around the world. We connect filmmakers, designers, musicians, writers, engineers... anyone with a great project, with thousands of people to make their dreams become true. Through crowdfunding, sharing the enthusiasm to participate in creative projects. To create a community coming together to support LGBT projects anywhere around the world. Discover and support awesome projects that have already started a crowfunding campaign. What are you waiting for? 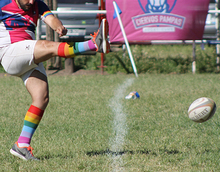 Ciervos Pampas Rugby Club, the first Latin America LGTBI rugby team it's looking for founds to play its first international match in Brazil. 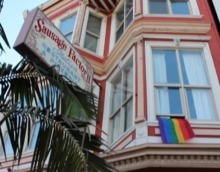 Help save Grand Central, the Radical Faerie house above the Sausage Factory in San Francisco's Castro district. This is who we are and how we live! Our goal is to give the Vietnamese community a face by making a book filled with interviews, photos and information. 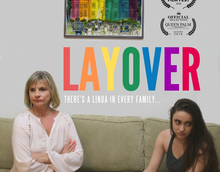 Brooke, a millennial living in LA with her girlfriend, gets saddled with hosting her homophobic Aunt due to an unexpected layover at LAX. What is your dream? Making a movie? Recording an album? Building an app? Dream big... and do it! Use the power of the crowds to raise the funds you need, and make your dream a reality. Your project will be creating buzz, even before being finished. Can you think of a better publicity? 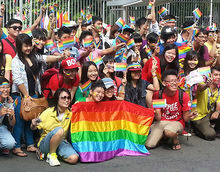 Discover exciting projects of the LGBT community anywhere in the world. Become part of awesome projects with a small support, and get a reward in return. Before it became popular, you already knew it would be a success. We are different. Pinkstart is a platform built to support the LGBT community. Your project will have better visibility being in the right place. Pinkstart, is FREE for LGBT non-profit organizations. If you have any questions, we will help you throughout the whole process. If you have a creative project and you need the funds, this is your place. Start creating a campaign! We provide you the tools to spread your dream to the community, giving it great visibility. With the support of the community, you will raise the funds you need. Your success is our success! Share it with all the people that have supported you. We support our community, that's why we have the lowest fees of any other crowdfunding platform. FREE for LGBT non-profit organizations. Flexible Funding:. Creators will receive the funds even if the fundraising goal is not reached. Fixed Funding: "All or nothing" model. Creators will receive the funds only if the project reaches its fundraising goal. Payments will only be charged if, the project reachs its fundraising goal. If the project doesn't reach its fundraising goal, Backers will not be charged. Payment Processor: All the payments are processed by Stripe. Creators will never have access to the Backers credit or debit card information. Stripe fees (Europe: 1.4% + 0.25€ , US: 2.9% +0.30c) will be charged on each payment transaction. Consult Stripe.com for more information. Pinkstart is a global network! We accept projects from more than 100 countries. Ready to start a project? Tell us about your idea and we will answer you in 48 hours.